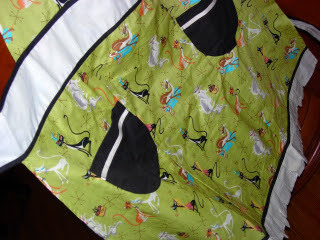 One totally cute party apron, with pockets. 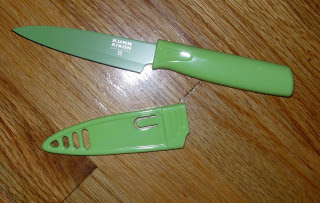 One totally useful travel knife, with sheaf, the last one left in one of my favorite kitchen colors. 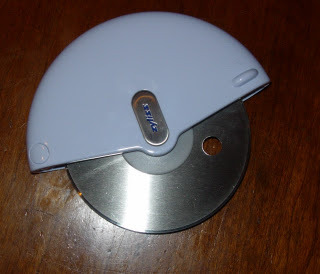 One cool pizza cutter, which I hope works a lot better than my old one. 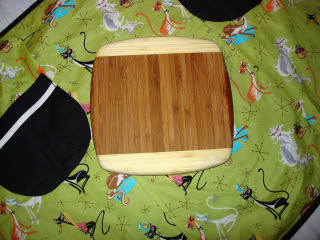 One cute little bamboo cutting board, which I've already used to cut apples for the kids' tuna salad. Notice that it is displayed with the background of the cool apron. 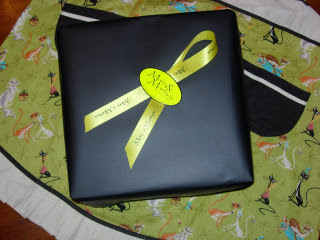 And here is the present, which you can't see, because it's wrapped. But how cool is it that their paper is black? And how cool is the apron background? Most auspiciously, as I was leaving, one of the ladies remembered that, for whatever reason, I was to be a given a chance to win a prize. Prizes are the best. And, in this contest, one was guaranteed a prize. I reached my hand into the jar, shuffled the cards around (Why did I shuffle? Dunno, must have been instinct) and pulled out a card. I won a 12 cup French Coffee Press. Most! Auspicious! We use a 12 cup press every day, but you never know when they will break, so this was a perfect prize for me. As I was browsing the mall in my kitchen tonight, I wandered into Endless.com. And there I found a pair of shoes I've been rocking since Spring**. My sister has a pair of sandals that always look awesome. I borrowed them once and was compelled to seek them out on Ebay within hours. They look good with everything. They make us look thinner, if it's possible for a mere pair of shoes to do that. And they are totally comfortable, in spite of the fact that they're platform heels. Wisely, my sister bought another pair, exactly the same, when we found them on sale at the mall. Why I did not buy another pair for myself, I will never know. She wears both of them regularly; I'm guessing she saves the newer ones to wear with skirts and to fancy parties. Anyhow, I came upon my shoes, on sale for half price. I emailed my sister (and followed up with a phone call twelve seconds later) to see if she, in her infinite wisdom, thought I should buy another pair. More importantly, I wanted to return the favor and give her the opportunity to order an awesome pair of shoes. We both got the shoes for a great price, most auspiciously. So...in conclusion...you know what this means for the Gamecocks. GAME! *Yet another bonus of shopping local: Baby J was asleep in the stroller and the ladies actually lowered their voices so he would stay asleep. And they let me leave him in the store when I had to go to my car to get a calling card to put in the wedding present. Tip of the day: Keep your engraved calling cards in the car, in case you buy a present unexpectedly. **By the way, I We have the brown ones. We don't like the black ones. And I bought my original pair at Kicks, which I'm telling you so you don't think I make a habit of internet shopping. I really do try to shop local, but a deal's a deal. Those shoes...shazam! I like 'em!